Yesterday was a wonderful day for searching for dragonflies at Occoquan Regional Park and among my finds was this beautiful female Painted Skimmer (Libellula semifasciata). This is the first one of the season for this species, which is relatively common compared to most of the early spring species. The patterns on the wing make this species stand out and definitely help in identifying. I love the way that the different colors on this dragonfly work so well together and give this dragonfly a refined and rather sophisticated look. It is an additional bonus that those colors are mirrored by the background colors in this image. 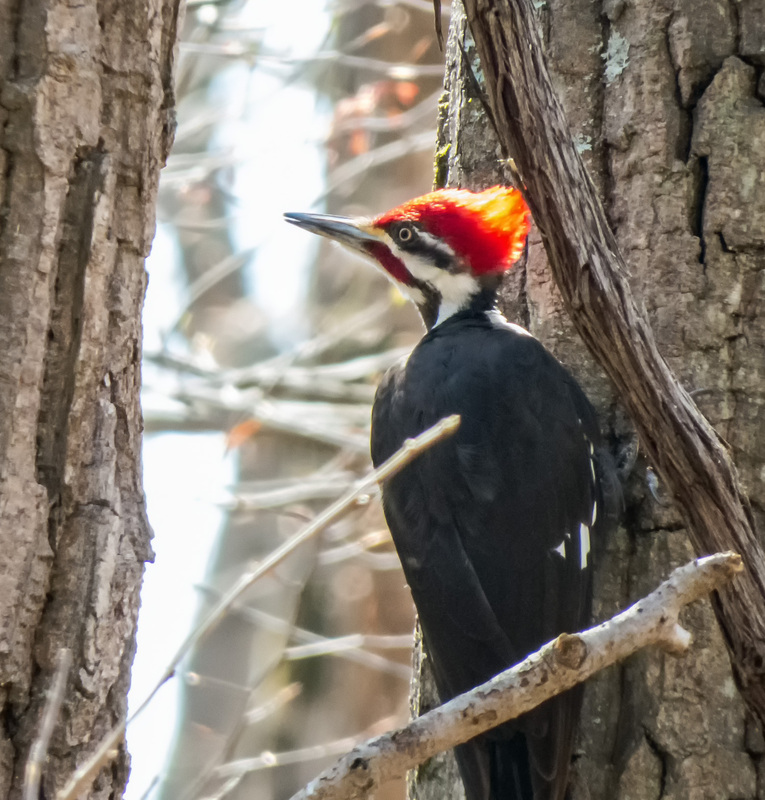 I was a little surprised and quite happy this past weekend to spot a Pileated Woodpecker (Dryocopus pileatus) poking about on the ground at Occoquan Regional Park. 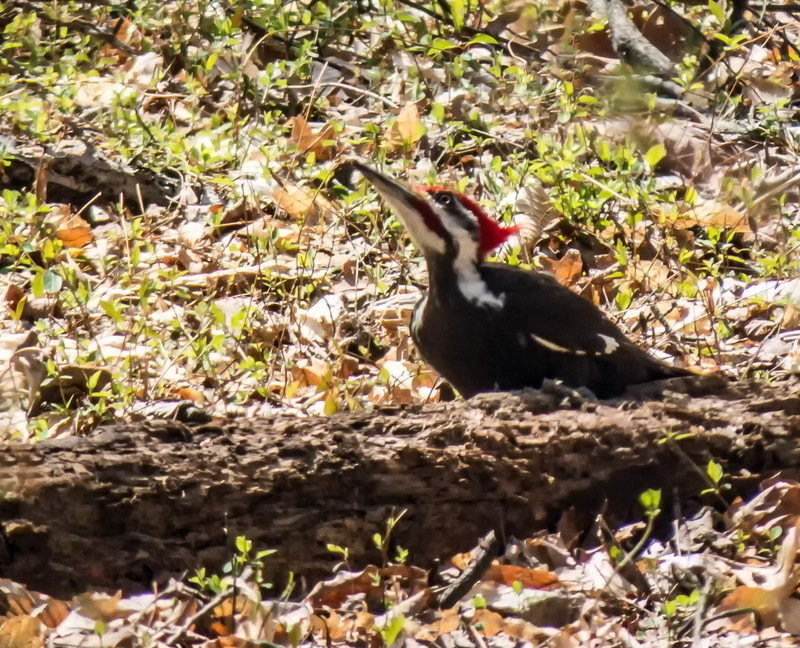 Most of the time I have to settle for high-angle shots when I am lucky enough to spot one of these giant woodpeckers. I have been told that these woodpeckers regularly probe fallen trees, but this was a first for me. After I inadvertently spooked the woodpecker, it flew to a nearby tree. The light was coming from the side and the front when I took the second shot and it made the woodpecker red crest look like it was on fire. Somehow it seemed appropriate, given that most redheads I have known have tended to be quite fiery. 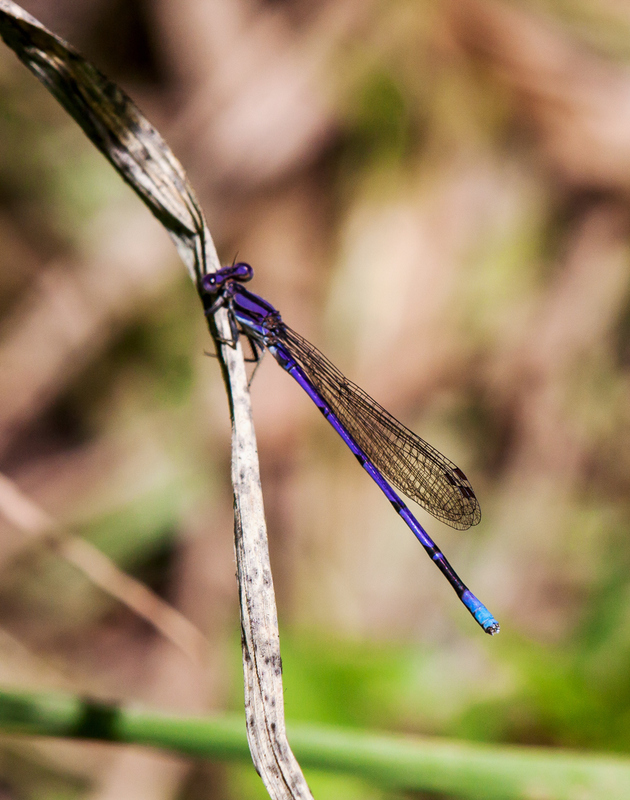 On Monday I was thrilled to get a shot of one of my favorite damselflies at Occoquan Regional Park, the beautifully colored Violet Dancer (Argia fumipennis violacea), a subspecies of the Variable Dancer damselfly (Argia fumipennis). I love the color combination of this tiny beauty, a spectacular shade of violet on its body and the wonderful blue accents. Sharp-eyed viewers may have noted that a photo of this same type of damselfly has been my banner image for quite some time. This shot from Monday is for Cindy Dyer, my photography mentor, who used to refer to me as her “grasshopper” and taught me some important lessons when I was just starting to get serious about my photography six years ago. 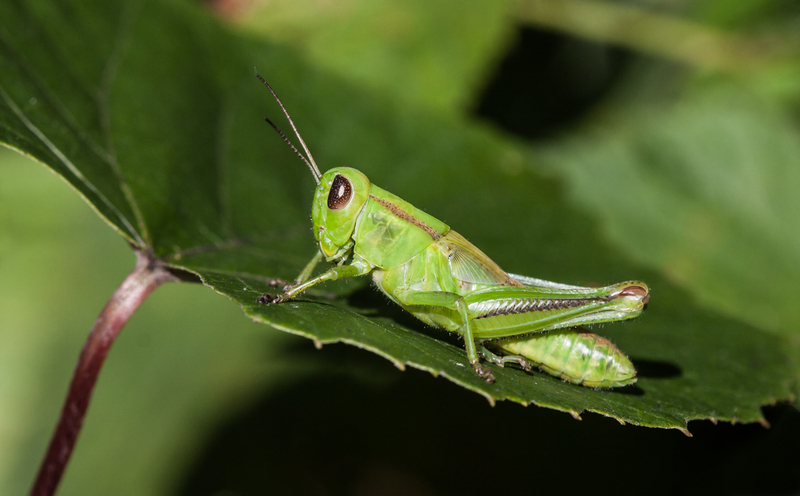 Folks of a certain age may recall that “grasshopper” was the nickname used by Master Po for his young student Kwai Chang Caine in the western martial arts television series Kung Fu in the 1970’s. The name is a reference to a wonderful scene in the pilot episode for the series in which the blind teacher helps to teach his new student that “seeing” requires more than the simple use of your eyes. In case you have never heard of the Kung Fu television series or want to relive a moment from your past, here is a link to a short YouTube video of the above-referenced scene. As a nature photographer, I think a lot about “seeing” as I seek a closer connection with the natural world and so many of its inhabitants. My observations have caused me to conclude that the pace of the natural world is different from that of my everyday life and that I consequently have to slow down in order to be in synch with it. Are you ever fully satisfied when you meet a goal? I think that many of us drawn to wildlife photograph are restless in our pursuit of newer and better images. We can celebrate our successes, but we tend to be self-critical. We are convinced that we can always improve our skills and our photos, that we need to keep pushing and pushing in a never ending quest for more interesting subjects or better conditions or sharper images . In many ways, that was the case for me this past Monday, when fellow dragonfly enthusiast Walter Sanford and I scoured an area of Occoquan Regional Park for spiketail dragonflies. 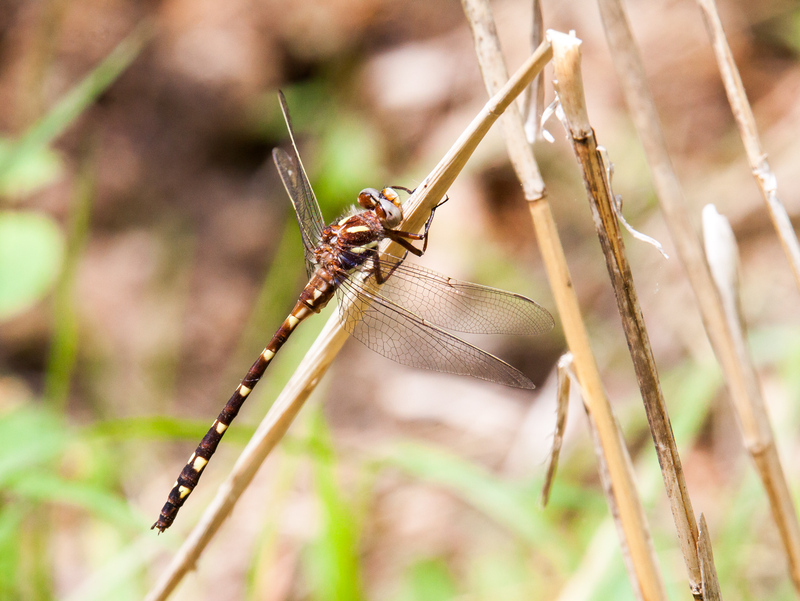 In a blog posting earlier this week I chronicled our long and ultimately successful search for the elusive Twin-spotted Spiketail. 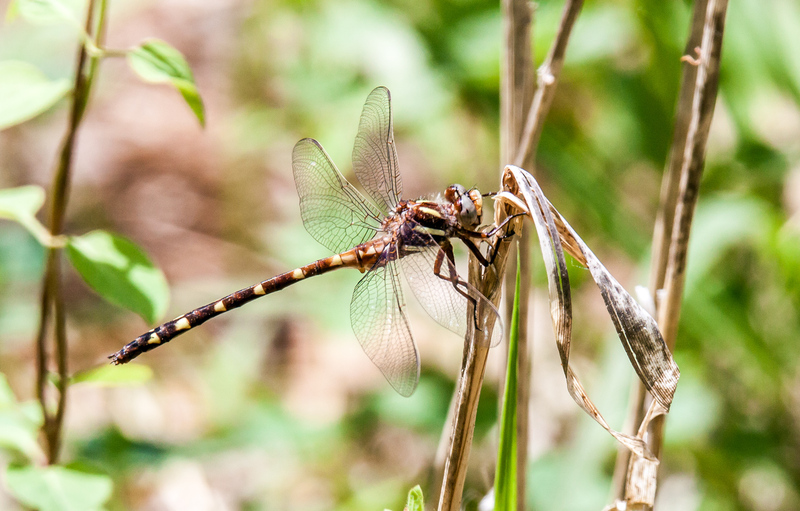 I was feeling a bit tired by the time we saw that dragonfly, but Walter had told me that an additional dragonfly species had been spotted in that same area, the Brown Spiketail dragonfly (Cordulegaster bilineata). So we kept going and went looking again in an area that we had searched earlier in the day. Some say that the definition of insanity is repeating the same actions and expecting different results. If that’s true, I guess that I qualify as being more than a little crazy. It turned out that we were lucky, really lucky and had multiple chances that afternoon to photograph several male Brown Spiketails. Unlike the Twin-spotted Spiketails from earlier in the day that flew away and never returned, the Brown Spiketails would fly only a short distance away when spooked and it was relatively easy to track them visually to their new perches. Eventually we reached a point of satiation where we would not even take a shot of a dragonfly if it was even partially obscured by vegetation or was facing in the wrong direction. We hoped we would see a female of the species, but it turns out that all of the spiketails we saw that day were males. The Brown Spiketail dragonflies seem to have a lighter-colored bodies than the Twin-spotted Spiketails (brown vs black) and has paler spots, but to my inexperienced eye they otherwise look pretty similar. I was happy to capture some relatively sharp images that you can see in even greater resolution by clicking on them. For even more detailed photos, check out Walter’s excellent images of our adventures in his blog posting today. He has mastered some techniques that allow him to capture an amazing amount of detail in his dragonfly shots. When you go out to take photos, do you have specific goals in mind? I consider myself to be an opportunistic shooter—I like to walk around in the wild and photograph whatever happens to catch my eye. This past Monday, though, I joined fellow dragonfly enthusiast and photographer Walter Sanford on a very targeted mission. We were going to search for some relatively uncommon dragonfly species called spiketails in a location where they had been recently seen. These species can be found only during a limited period of the spring and only at small forest streams or spring-fed seepages. 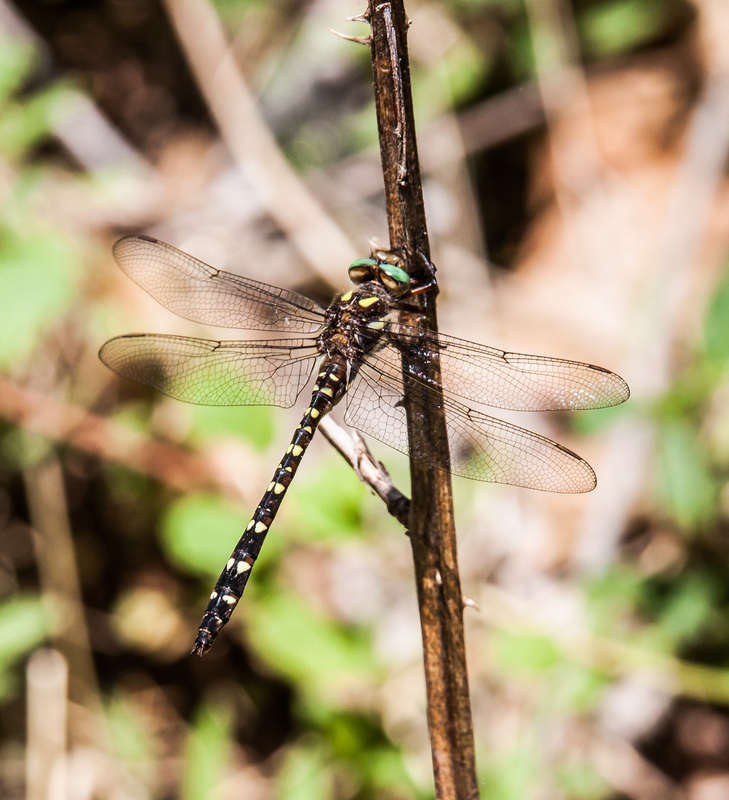 We were particularly interested in the Twin-spotted Spiketail (Cordulegaster maculata), a dragonfly that is less than 3 inches in length (76 mm) and usually hangs vertically or at an angle in vegetation close to the ground. As you can probably tell from my description, these dragonflies are tough to find. Walter and I have hunted together for dragonflies in the past and have found that it helps to work in pairs, so that if one flushes a dragonfly, the other person can sometimes track it to its new location. We searched and searched for what seemed like hours and came up empty-handed. Just when it seemed like we might be getting ready to concede defeat, I spotted what I think was a Twin-spotted Spiketail. I called out to Walter and put my camera to my eye. Alas, the dragonfly flew away before I could get a shot. Previously he and I had a conversation about whether it was better to have seen none or to have seen one and not gotten a shot. I was now faced with the second case. 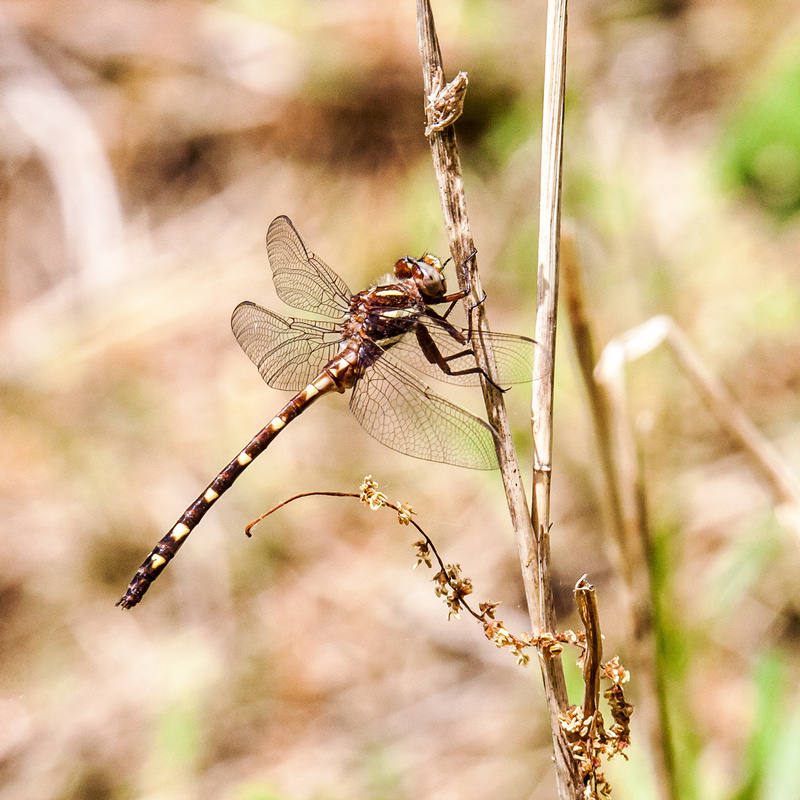 We figured that our odds were about one in a million of spotting another Twin-spotted Spiketail, but having seen one, we had a glimmer of hope and kept searching. Without intending to do so, we drifted apart, out of sight of each other. Suddenly I heard Walter’s voice calling to me, saying that he had spotted one. The basic problem was that I did not know where he was. I wrongly assumed that he was near a small stream, so I rushed downhill through the muck and the thorns, but didn’t see him. He called out again even more insistently and I realized that he was uphill from me. Apparently I am not good at determining directions on the basis of sounds. I scrambled up the bank to him and he motioned to me to move around him on the left. About that time, the dragonfly that he was photographing took off and headed down the trail. Walter was about ready to give chase when I told him to stop—I had spotted what turned out to be a male Twin-spotted Spiketail at ankle-height just a few feet from where he was standing. Our patience and persistence ended up being rewarded and I was thrilled to be able to get some shots of this beautiful dragonfly, a species that I had never before encountered. Long-time readers may recall that Walter and I are very different in our approaches to many things. Our photography gear is different; my background and education is in liberal arts and his is in science; and our personalities are quite dissimilar. Not surprisingly, our writing styles vary too. Several times in the past we have done companion blog postings after our adventures. 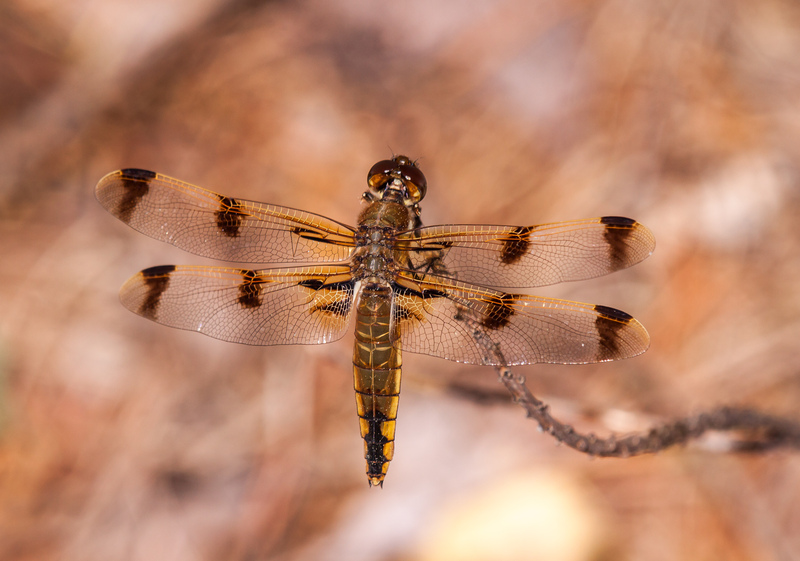 Check out Walter’s blog post today for his perspective on our hunt for this elusive dragonfly and for his wonderful images. As it turned out, our day of dragonfly hunting was not yet over, but that will the subject of a future blog posting.